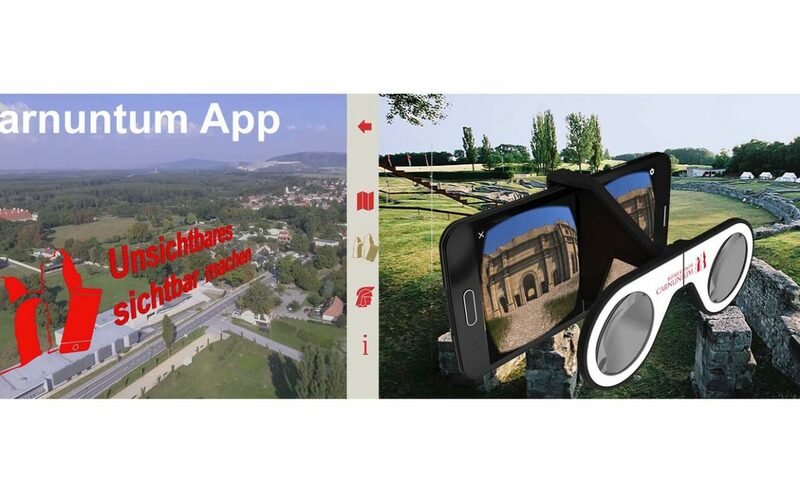 Bringing the romans remains to life using the latest technology at the site of the former roman capital of Carnuntum, Austria is one of the main goals of the archaeological park carnuntum. In 2018 it was therfore decided to invest into the production of an augmented & immersive reality application for mobile devices, bringing in the gathered and scientifically publicized data sets and spread the knowledge to a wider public. CarPK2018 from 7reasons Medien GmbH on Vimeo. Bringing the romans remains to life using the latest technology at the site of the former roman capital of Carnuntum, Austria is one of the main goals of the archaeological park carnuntum. At the instigation of the Province of Lower Austria, the whole area (covering almost 10 sq. km) of the ancient metropolis of Carnuntum was investigated by the Ludwig Boltzmann Institute for Archaeological Prospection and Virtual Archaeology (LBI ArchPro), the Central Institute for Meteorology and Geodynamics, as well as international partners, using ground radar and geomagnetics in Bad Deutsch-Altenburg and Petronell-Carnuntum. After completing the on-site computations, experts from these institutions as well as from the Institute for the Study of Ancient Culture of the Austrian Academy of Sciences (IKAnt) and from the Province of Lower Austria worked to evaluate these results. After the locating of a gladiator school in the year 2011, the earliest marching camps in the year 2014 and the barracks of the Roman provincial governor’s guards in the year 2016, further sensational discoveries have been made. The new completed map shows – thousands of years later – for the first time all the Roman remains that are hidden underground. Throughout the last 10 years a digital reconstruction of the site was made making use of the interpretations of the material gathered in the ongoing prospections and excavations as well as the followed interpretations of involved institutes, universities and partners. The resulting 3d Models where used for various exhibitions, documentary -films and scientific publications. Evidence-based physical reconstructions in original scale with fully furnished and functioning houses had been undertaken and make ancient Roman life from over 1.700 years ago palpable in the Roman City Quarter. In 2018 it was decided to invest into the production of an augmented & immersive reality application for mobile devices, bringing in the gathered and scientifically publicized data sets and spread the knowledge to a wider public. Together with the virtual reconstructions, digitized datasets of artifacts and objects where 3d laser -scanned and prepared for the reuse in this mobile application in order to reference these finds to their original environment. 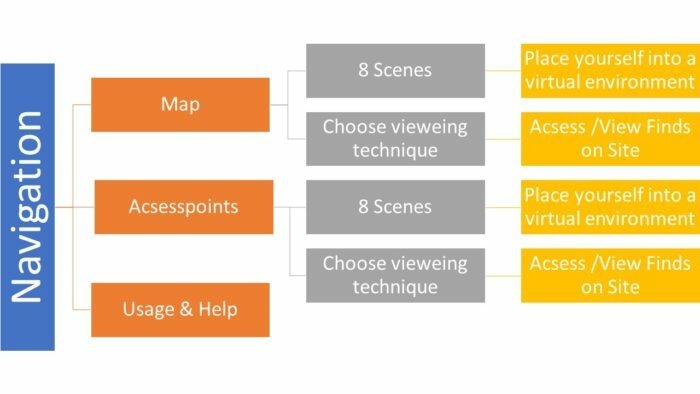 The content is delivered through different visualizations techniques and allow the user to choose between them of the chosen scenes. Augmentation is carried out with Image tracking and indoor positioning using a beacon system. Beacons are typically transmitters in client-based methods. For example, they enable indoor navigation for airline passengers using the app – cross-platform and with an accuracy of up to 1 meter. Never the less there is also the possibility to choose your desired scene through a map-based navigation system. A special part of the functionality allows the user to make a “selfy” by choosing the corresponding dress, blending his face into the premade template and sending the produced image to his or a friends e-mail account. At the time of writing there are 8 complete scenes and approx. 8 Objects which can be displayed while the option to adaptation, adding further content and updated technologies. In order to monitor the user experience and opinions, the chats and ratings on the app stores and the visitor’s centers website are observed as well as direct questioning at the archaeological park by the local staff is carried out. At the time writing more than 1000 downloads had been made andthere where no crucial issues, neither technological or content wise. 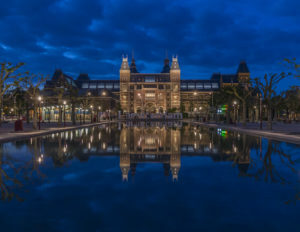 It was planned to implement a stable and extendable technology based on preexisting content which had to be adjusted to the needs of the application. The overall design had to suit all age groups and was held in the cooperate identidy of the archaeological park. As a core tool for the implementation of content and game-logic, unity3d was used in conjunction with fuvoria AR engine. Here a framework was set up to provide all functionalities and future implementations. The first draft application was internally tested and after 2 weeks published. By monitoring the visitors behavior we implmented some changes within the first three month after the launch and added more content and functionality in the course of the first year. As mentioned there was a debugging, testing and monitoring period which gave us an insight to the necessary changes made which where implemented hereafter. The followed updates and changes where done on a regular basis and provided via the app & playstores of the appropriate IOS systems.